I've mentioned before I like my "wishlist" items to be things I do not or would not typically purchase for myself. When necessary or desired, I'll splurge on a great pair of shoes, and even once and a while I'll get a nice bag. The one thing I never buy is jewelry. Real jewelry. If it's $50 and under I'll get it, but that's typically something cheap, fake, and serves it's trendy-couple-of-wears purpose. 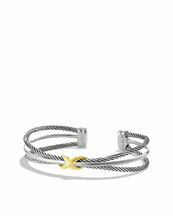 Yeah, I got a thing for David Yurman. I really like two toned DY items because when my parents split up my mom reset her engagement diamond in a custom DY inspired ring. Then she decided to give the ring to me on my 21st birthday (yay!). It's sentimental and I love the look of it. When I got engaged, she passed down a DY Linked Bracelet that she bought herself in the 90's. It's since been discontinued but it's also two tone with 5 diamonds that mimic the pattern on my 'etoile' wedding band. I really love both pieces and wear them all the time. 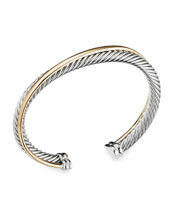 I would love to compliment them with another... hence my affinity for gold, silver, and the signature DY "roping". Do you wear jewelry with a signature look or prefer one designer's styles? Hi honey, You can take gold watch off your wish list too. YOU WON. Send me your email and address and I'll get the Orient Watch peeps to send it to you asap. This is AH-MAZING!!!... Thanks Diabolina! Love your blog... readers, please check out Da Fashionista's LA Style, fashion finds, super fun social life, and adorable momma at her blog..